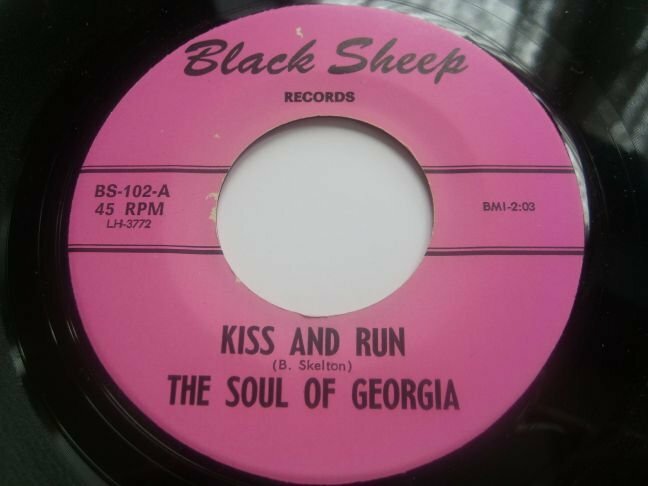 SOUL OF GEORGIA - KISS AND RUN / COOL - BLACK SHEEP BS 102. I've found another 45 by them in the guides but not this one and someone wants to buy it but I haven't a clue what to charge. Anyone heard of it, know it? Thanks Ged. Cool is just a run of the mill rock n roll / r & b instrumental, totally different to the other (vocal) side. Cool is just a run of the mill rock n roll / r & b instrumental, totally different to the other (vocal) side. "Cool" is a Major Bill Smith "special"... He released it at least 25 times as a "filler b-side" on his labels (Charay, Soft, LeCam etc.) when he didn't want to fork out more money on his artists. The same tune was also issued numerous times as "Patsy" and "Alpine Winter". "Kiss And Run" is written by Bobby Skel (Bobby Skelton). There are also versions recorded by Bruce Channel on Soft, J. Frank Wilson on Josie and by Bobby Skel himself on Soft. I haven't heard the Soul Of Georgia version, but it wouldn't surprise me if they all utilise the same backing track (another MBS "special"...). Any chance of a sound clip of the 45 on Black Sheep? Thanks for the great info guys. It's f*cking terrible. Listen to the out of tune strings right at the end. As well as those titles mentioned by Sebastian, "Cool" is also on the flip of Sons Of Moses "Soul Symphony" (I can't remember what it's called there) and Carolyn Sullivan's "Dead" (where it's called 'Wow"). Plus, as Sebastian says, at least two dozen other Major Bill Smith-related flipsides. I have the Frank J Wilson version, not very good either, straight early 60's pop.